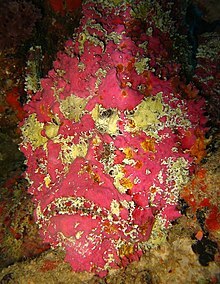 Synanceia verrucosa is a fish species known as the reef stonefish. It is a carnivorous ray-finned fish with venomous spines. It lives on reef bottoms camouflaged as a rock. It is the most venomous known fish in the world. It can be lethal to humans. This stonefish is usually brown or gray, and it may have areas of yellow, orange or red. This species reaches up to 30–40 centimeters long; a specimen of 51 centimeters has been recorded. This stonefish lives primarily above the Tropic of Capricorn. It is the most widespread species in the stonefish family, and is known from shallow tropical marine waters in the Pacific and Indian Oceans from the Red Sea to the Great Barrier Reef. There is also evidence showing that S. verrucosa may exist within the Mediterranean Sea. An adult specimen was captured in 2010 near Yavne, Israel. This fish lives in coral reefs. It may settle on and around rocks and plants, or rest on the seabed. 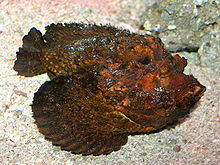 The reef stonefish eats mostly small fish, shrimp and other crustaceans. The primary commercial significance of this stonefish is as an aquarium pet. It is also sold for meat in Hong Kong markets. It is consumed in the Philippines, especially in Chinese restaurants, and in Japan. The venom consists of a mixture of proteins, including the hemolytic stonustoxin, the proteinaceous verrucotoxin, and the cardiotoxic cardioleputin. Wikimedia Commons has media related to Synanceia verrucosa. ^ Capuli, E.E. ; Ortañez, A.K. "Synanceia verrucosa, stonefish". Fishbase. Retrieved 30 June 2014. ^ Wells, V. "The Stonefish – The Deadliest Fish in The World". Petplace. Retrieved 30 June 2014. ^ a b c McGrouther, M. (21 February 2013). "Reef Stonefish, Synanceia verrucosa (Bloch & Schneider, 1801)". Sydney: Australian Museum. Retrieved 30 June 2014. ^ Edelist, D.; Spanier, E.; Golani, D. (June 2011). "Evidence for the cccurrence of the Indo-Pacific stonefish, Synanceia verrucosa (Actinopterygii: Scorpaeniformes: Synanceiidae), in the Mediterranean Sea". Acta Ichthyologica et Piscatoria. 41 (2): 129–131. doi:10.3750/AIP2011.41.2.09. ^ a b Taylor, G. (2000). "Toxic fish spine injury: lessons from 11 years experience" (PDF). South Pacific Underwater Medicine Society Journal. 30 (1): 7–8. ^ White, J. (2001). "First Aid for Marine Bites and Stings". CSL Antivenom Handbook. www.toxinology.com. Retrieved 30 June 2014. Synanceia verrucosa. Integrated Taxonomic Information System.